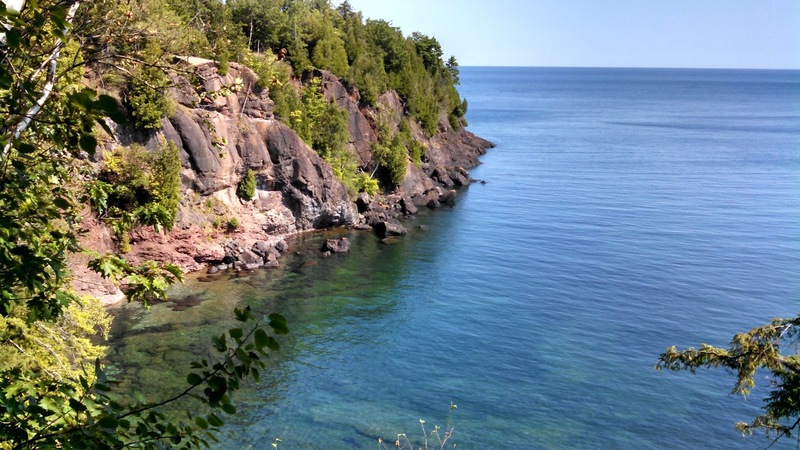 Presque Isle in Marquette is not an island. It's almost an island. Or is it more than an island? 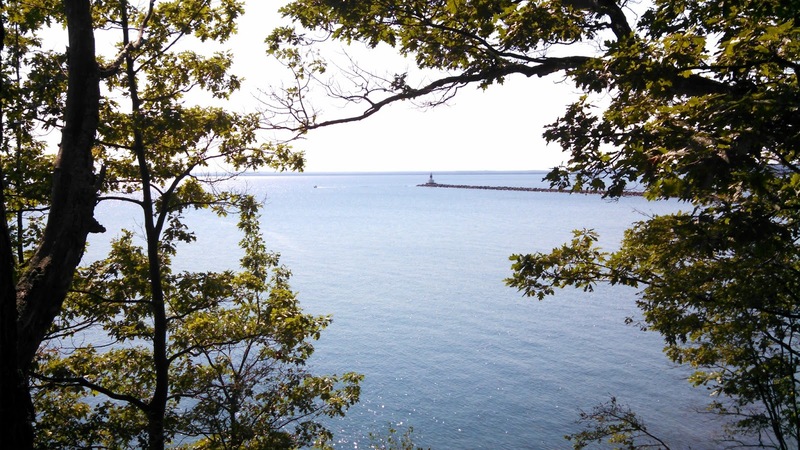 "Presque isle" means "almost and island" in French, and this peninsular park holds 323 acres of natural beauty. On a sunny Thursday morning, my family and I walked around the perimeter of the park. The park's road along the perimeter was closed to vehicular traffic, as it is for a few hours several times per week, so our daughters were safe to dart to and fro across the street without us worrying about cars. We parked and began our walk near the Presque Isle breakwater and light, where we watched a couple of kayakers launch and a few people walk along the breakwater towards the lighthouse. 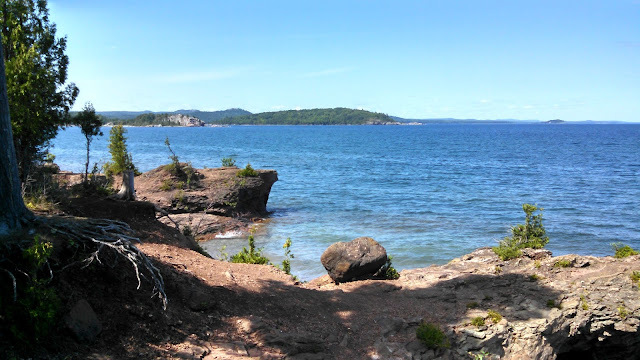 The walk along the road is approximately two miles total, but we made frequent stops to appreciate the spectacular views of Lake Superior from the cliffs above the water. Presque Isle also has interior foot trails, but we stuck to the road since our two young daughters were with us. Plus, I wanted to make sure I made it to the Black Rocks, since I knew how to get there from the road. Much of Presque Isle's shoreline is composed of rocky cliffs. 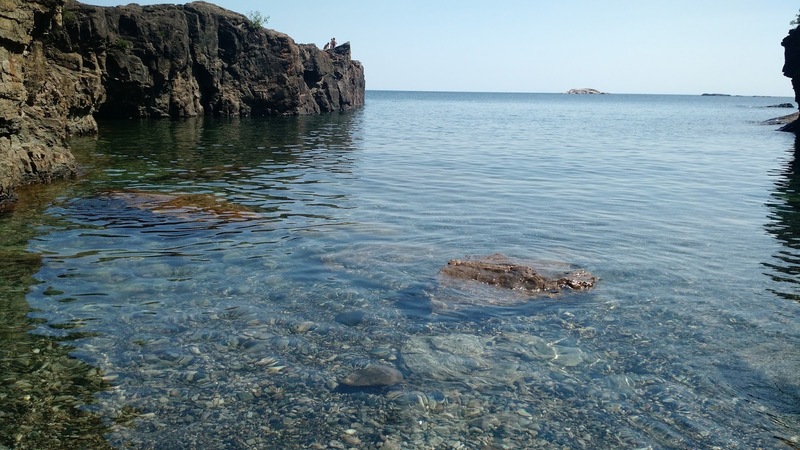 The Black Rocks are a rock formation on the north end of the park that juts out into Lake Superior. The rocks rise to about 15 feet above the water line, making it a popular spot to jump into the cool waters below. We found the Black Rocks by following the sounds of loud and sudden splashes and people happily screaming until we reached a parking lot where we could go to the left and climb over the rocks or head to the right towards the water. Not knowing that the rocks are accessible by wading into the water and scaling the rocks, I decided to climb over the rocks barefoot and wishing I had water shoes on. 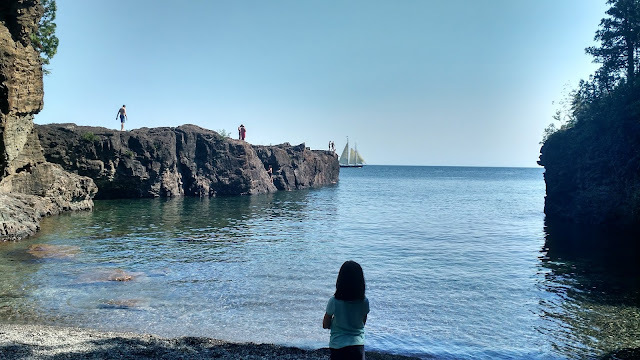 My wife, Allison, and our daughters waited near the water's edge where a small beach sits between the Black Rocks on the left and a smaller rock formation on the right. I highly recommend checking out the Black Rocks even if you don't take the plunge. The little cove is a beautiful place to relax and watch others jump from the cliff. I told Allison to have the camera ready in case I decided to jump. When I reached the area of the cliff where people were jumping, I looked over the edge and saw crystal-clear water with a ton of giant rocks below the surface. The water was still and like glass. Not sure if the water was distorting my depth perception, I asked a woman who was with her teenage kids whether it was safe to jump from this spot. She assured me that it was, but I waited until she and her kids jumped. Seeing that they survived the plummet, I edged a little farther away from the shore towards the spot where they jumped to ensure I did not meet a horrific death on the rocks below. The water was even more clear from the edge of the cliff. As my toes dangled over the precipice, I had second thoughts about jumping. "This feels lot higher than 15 feet above the surface. What if you slip and bounce off the cliff or accidentally do a belly flop? But those kids did it, so you kind of have to." I took a deep breath, leaped, and splashed into the cool water below. I did not hire a stunt double. I promise. I swam back towards the beach, but then decided to climb the rocks again for another jump, this time from a slightly higher spot. Allison then took a couple of turns jumping before I swam back out for one more jump. If the kids were old enough to jump or swim unsupervised, I would have jumped several more times and spent more time swimming. The whole experience was exhilarating. We toweled off and continued on our walk. I listened to the fading sounds of revelers crashing into the water, wishing I had time for one more leap.